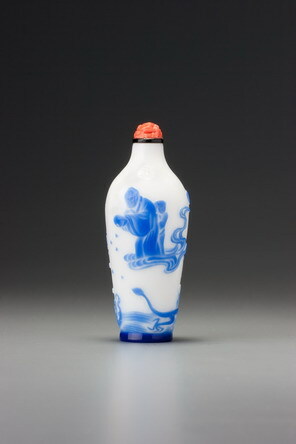 Several excellent examples of glass overlay attributable to Yangzhou are recorded that have sapphire blue overlay on white. Nowhere is this combination employed to more spectacular effect than here. 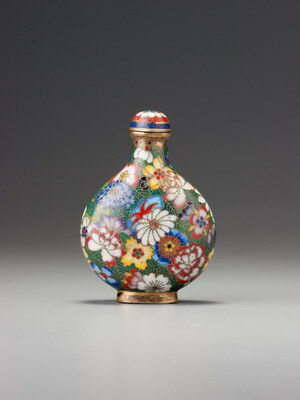 One of the great masterpieces of the low-relief, painterly style, its appeal is further enhanced by its unusual shape, a rare example of the meiping (‘prunus blossom vase’) form of the school (for another, companion piece to this one, see JICSBS, Spring, 1996, p. 35). The design is unique; the colour combination spectacular, with a blue of extraordinary intensity; the shading of the overlay colour as impressive as any of its kind, and the carving nothing short of masterly. It is almost a relief to find that the footrim is imperfectly matched to the overlay colour. Individual lines of contrasting relief are used to depict clouds and water, although in the latter case it is more in the nature of a ‘wash’ of blue cut through to the ground colour to leave white lines between. Although relatively rare, this style of depicting both clouds and water was used also on Sale 3, lot 92. The clouds on which one luohan stands are spectacularly well carved. The artist has also employed his highly effective raised dots as part of the design, as he did for the grass on Sale 2, lot 141, and for emphasis in the water on Sale 2, lot 73. Here it is used for whatever Shegong is emptying from his alms bowl - perhaps raindrops, given Shegong’s rain-making associations. This is among the more distinctive dragons in Qing glass carving, and we find an intriguing feature in the overlay in the centre of the dragon’s body. What appears to be a short crack runs through it, starting at the point where the body is raised from the ground colour, and continuing down to the edge of the footrim. Such a crack might have been expected to result from a blow at the footrim, and thus would start there and travel upwards. The footrim itself, however, displays no crack, and our answer is provided by the fact that one side of what appears to be a crack is washed precisely with blue, while the other is not. This shows it to be a natural flaw of some sort, probably occurring during the production process, which may be related to barely perceptible streaks in the white glass, running in the same direction. Such a blue wash, confined to one side of what appears to be a crack, would occur only during manufacture, ruling out subsequent, accidental damage, and showing it to be not a crack, but a streak in the coloured glass. Despite constituting such a spectacular design, the two luohan here are light entertainment rather than the main subject. As indicated by the inscription, the clouds and the wind (associated with the dragon and the tiger respectively) are the principal elements the designer wishes to evoke. These two luohan are commonly referred to as xianglong fuhu (‘Luohan who could subdue the dragon and the tiger’), and may be identified as Shegong and Monk Tiao. According to Liang gaoseng zhuan (Biographies of Eminent Buddhist Monks [Compiled in the] Liang Dynasty), Shegong was a Central Asian who travelled to Chang’an in 375 AD during the reign of Fu Jian (338-385). He had the ability to summon the divine dragon by reciting incantations, and whenever the country was afflicted by drought, Fu Jian ordered Shegong to send for the dragon. The fabulous creature would immediately appear, and the moment it had dived into Shegong’s alms bowl, rain poured down from the sky. In another source, Xu gaoseng zhuan (A Supplement to Biographies of Eminent Buddhist Monks), Monk Chou (given as Tiao in Treasury 5, but the Tang commentary to the biography indicates that it should be Chou) is recorded as encountering two angry tigers in combat, whose resounding roars shook the surrounding rocks. He used his staff to separate them and the two wild beasts immediately stopped fighting. As a result of the legends related to them, the idiomatic expression xianglong fuhu, alluding to their unique powers, has come to symbolize individuals with the ability to overcome extreme difficulties or powerful adversaries. The idiomatic expression: ‘The meeting of the wind and the clouds’ signifies an opportune moment and is often used to allude to talented people coming into critical situations at just the right moment. The underlying message is: ‘May an opportune moment arrive soon so you can demonstrate your ability.’ Well, it certainly seems to have done for this Yangzhou glass carver, who rose to the occasion splendidly.